I found an interesting article "Make Video Calls With Windows Live Messenger". I thought this might be an interesting thing to try, and very useful if it worked. So I opened Windows Live Messenger on My Windows 7 PC and attempted to use it, however it required me to get an ID. I was taken to a website to sign up for an ID, and next to the sign up button was the message (paraphrased) "You Agree to Accept SPAM". NO WAY! 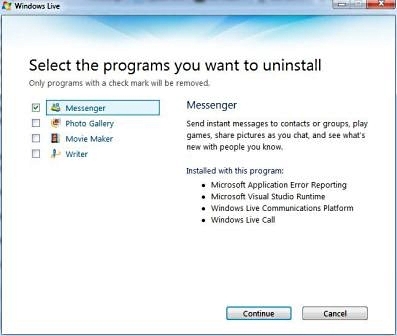 So I closed the webpage and Windows Live Messenger. 1. 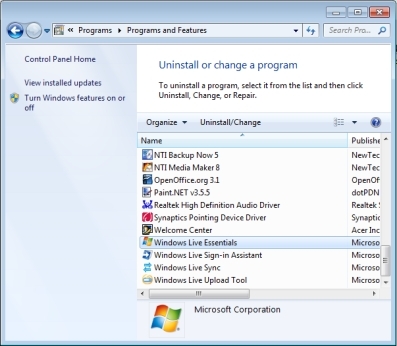 In Control Panel, click on the Uninstall a program link. 2. In the list of programs that appears, scroll down and highlight Windows Live Essentials, then on the toolbar at the top of the list, click on Uninstall⁄Change. 3. 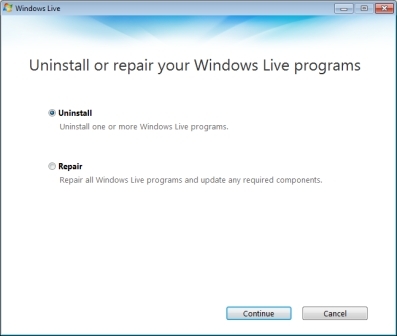 A window appears with the message "Uninstall or repair your Windows Live programs". Make sure the () Uninstall radio button is set, then click on the [Continue] button.